Thank you for visiting our PC friendly website. Our mobile friendly website is www.peritalia.com To check availability & special offers, click on the calendar above, insert your arrival date and the number of nights you want then press the search button. To book direct on-line securely please follow the instructions. 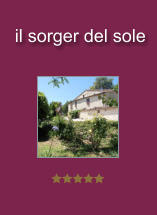 Established in 2007 il sorger del sole named after the spectacular sunrises facing the house, is a unique, charming and intimate bed & breakfast with breathtaking panoramic views of walled medieval hilltop towns, rolling hills of gold, brown & green and the azure Adriatic Sea. This listed ancient stone farmhouse oozes charm & character, originally constructed as a three storey country house around the late 17th century, is set within its own four acres of aged olive groves on St Georges Hill with the walled medieval town of Cingoli famed as “The Balcony of Le Marche” forming the backdrop. il sorger del sole offers the privacy, comfort & space, peace and tranquillity of the countryside with shops, restaurant and bars within walking distance. Please visit the rest of our website. 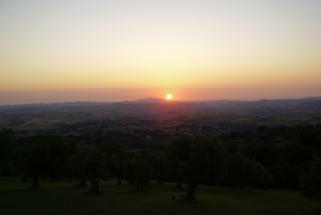 We would love to welcome you to il sorger del sole and hope to see you soon. Our special offer room rate starts from just 55.00€ per room per night, including breakfast(s) and “Added Value Booking Extras” (direct bookings only) and your direct booking is safe and secure. Thank you for visiting our PC friendly website. Our mobile friendly website is www.peritalia.com To check availability & special offers, click on the calendar, insert your arrival date and the number of nights you want then press the search button. To book direct on-line securely please follow the instructions. Established in 2007 il sorger del sole named after the spectacular sunrises facing the house, is a unique, charming and intimate bed & breakfast with breathtaking panoramic views of walled medieval hilltop towns, rolling hills of gold, brown & green and the azure Adriatic Sea. 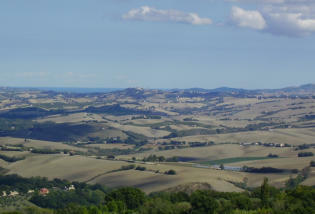 This listed ancient stone farmhouse oozes charm & character, originally constructed as a three storey country house around the late 17th century, is set within its own four acres of aged olive groves on St Georges Hill with the walled medieval town of Cingoli famed as “The Balcony of Le Marche” forming the backdrop. il sorger del sole offers the privacy, comfort & space, peace and tranquillity of the countryside with shops, restaurant and bars within walking distance. Please visit the rest of our website. 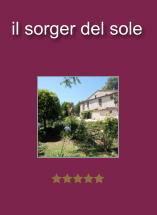 We would love to welcome you to il sorger del sole and hope to see you soon. Our special offer room starts from just 55.00€ per room per night, including breakfast(s) and “Added Value Booking Extras” (direct bookings only) and your direct booking is safe and secure.